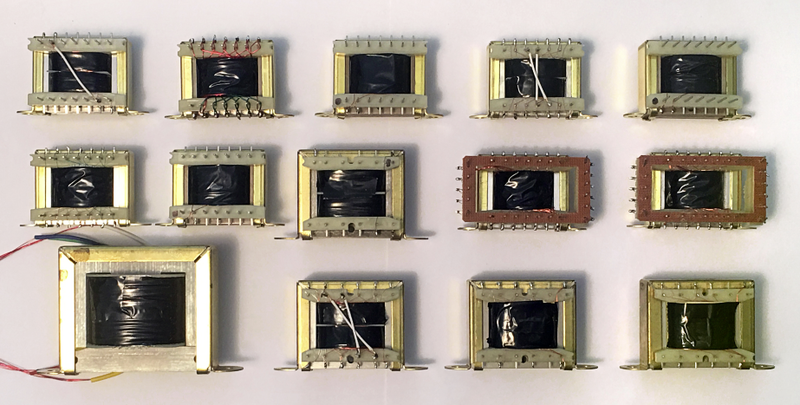 Pictured below are 14 pieces of lovingly hand crafted nickel for an all out design of a microphone preamp by our good friend Peter in Berlin. This device is unique because unlike the typical professional "buffer it all and let god find the music" approach of some, Peter harkens back to the days of yore when transformers and inductors were the proper tools to use and what something sounded like actually mattered. 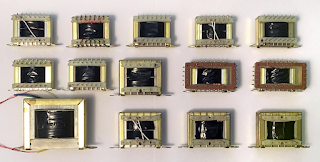 The 14 permalloy pieces consist of 4 - DC carrying output transformers that load active devices, 2 - level control autoformers, 2 - tapped filter chokes, 4 - nickel power supply chokes, an input transformer and a phantom power choke. No caps exist outside the power supply and at the next ETF I will lobby for some filament supplies. As it stand, i think it is awesome and if given the choice between using transformer loaded Fet's and chokes or tubes and caps I think peter made a wise choice.